As anyone could guess, the Yahoo executive exodus continues. Kent Goldman, Yahoo’s Director of Corporate Development and one of their top deal guys, is rumored to be leaving the company. 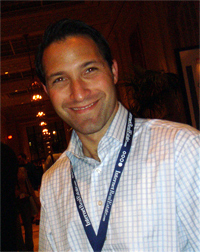 Goldman joined Yahoo in 2004 as Director of Business Strategy, reporting to Toby Coppel (at that time Yahoo’s Chief Strategy Officer – now Managing Director of Yahoo Europe). If this is accurate, the total number of Yahoo execs who have exited the company since January 2007 is approximately 115. 18 top execs have left this month alone, including Brad Garlinghouse, Jeff Weiner, Vish Makhijani, Qi Lu, Caterina Fake, Stewart Butterfield and Joshua Schachter. The fact Yahoo is now losing deal guys isn’t necessarily a sign of good or bad news in particular. In 2007, Yahoo Director of Corporate Development Michael Marquez left Yahoo to become the Vice President of Strategy and Corporate Development for CBS Interactive (he was recently promoted to EVP). It may just be that Goldman was given an offer to go somewhere else that he couldn’t refuse. Update: Interestingly Kent recently joined the ever-growing Yahoo Alumni group on Facebook, and a couple days earlier he became a fan of First Round Capital. We’ll be contacting them to see if he has any connection to the firm. Update 2: We have confirmed that Kent is joining First Round Capital.